This photo shows zero mold growth on square latex paint swatch treated with Endurance BioBarrier Mold Prevention Spray. Harsh lab conditions: Swatch was placed in mold inoculated petri dish for 3 weeks. Petri dish had gelatin layer to feed the mold. 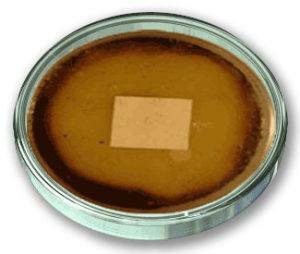 Mold only appears as a dark growth on the gelatin around the perimeter of the petri dish. An independent laboratory ran two tests. Test 1. Latex paint swatch treated with our Mold Prevention Spray and air dried. The swatch was placed on a layer of gelatin in a petri dish. Entire petri dish was then inoculated with mold spores. The gelatin layer was a food source for the mold. After 3 weeks, you can see in the photo the thick dark ring of mold growth around the outer perimeter of the petri dish’s gelatin layer. However, the treated paint swatch and area around it has NO MOLD GROWTH! Test 2. The second test was almost an identical setup. Except this time after the paint swatch was treated and dried, it was placed under running water for 24 hours! The goal was to test whether our invisible Mold Prevention Spray coating would get rinsed away. Once again, after 3 weeks the paint swatch was MOLD FREE! This supports our claim of protecting through 100’s of wet-dry cycles. Almost identical mold-free gelatin area around the swatch, too. What is driving these impressive results? Our high-tech formula uses microscopic “sticky” polymers to invisibly bind a proprietary blend of EPA registered fungicides and biocides to virtually any surface. This invisible protective microscopic layer will last through 100’s of wet-dry cycles, the whole time inhibiting mold, mildew, germs and musty odors. This is why we are able to offer such long-term guarantees. Competitors’ salt-based mold cleaners and mold preventers get diluted or rinsed away when exposed to water, humidity or condensation. By the way, please avoid using bleach cleaning products on mold. Not only is bleach toxic, but it also doesn’t kill mold roots embedded in porous surfaces. Learn more by reading our article on why bleach can’t kill mold. Our products are certified non-toxic with no harmful fumes (zero VOCs). And our mold prevention spray penetrates into porous surfaces to inhibit mold roots and spores. Don’t spend time and money frequently re-applying other mold cleaners and preventers that don’t last very long at all. Our Mold Prevention Spray is guaranteed to last 6 months on high traffic surfaces, 2 years on indoor/outdoor surfaces, 5 years in HVAC ducts, and 25 years on enclosed surfaces.